Mark Cavendish lost out to Italian Daniele Bennati in a photo-finish on stage 12 of the Giro D'Italia. The Briton, Bennati and Australian Robbie McEwen were locked as they sprinted for the line with officials taking several minutes to split them. Bennati was given the nod with a time of four hours 5.29 minutes over the 107-mile route ahead of Cavendish and McEwen to claim his third stage win. Giovanni Visconti retained his overall lead for the seventh day running. Cavendish considered making an appeal against the judges' decision but changed his mind when he saw the photo finish. "If the finish line had been five metres further on, I'd have got him, but unfortunately it wasn't," he said. "It's tough when it's that close and you lose but I'll try and win on Friday in Cittadella." Who's going to be in pink in Milan? Bennati said: "I thought I'd lost it but the judges told me I won it by just three centimetres. I've lost sprints like that in the past but this time I won it. "I knew I had to be first into the last corner if I wanted to win. It meant I had to do a long sprint but it was the best tactic. "If I'd been behind Cavendish I would have lost because he's the fastest in the world in the last 50 metres of a sprint." Friday's 177km 13th leg from Modena to Cittadella is the last flat stage for the sprinters before the race heads into the mountains. 2. Mark Cavendish (GB) High Road "
3. 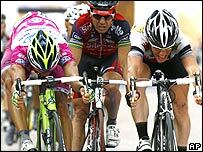 Robbie McEwen (Aut) Silence-Lotto "
4. Koldo Fernandez (Spa) Euskaltel-Euskadi "
5. Paolo Bettini (Ita) Quick Step "
6. Robert Forster (Ger) Gerolsteiner "
7. Luciano Pagliarini (Brz) Saunier Duval "
8. Assan Bazayev (Kaz) Astana "
9. Alexandre Usov (Bel) AG2R "
10. Alexander Serov (Rus) Tinkoff Credit Systems "
10. Gustav Erik Larsson (Swe) same time.